Over the years, I coded a few open-source projects for Linux and FreeDOS. I leave them here just in case anybody finds them useful. The FreeDOS utilities are still quite viable and have no known issues. BOINCprog is no longer maintained since I am no longer using Linux or coding in Kylix. sleep comes from the UNIX world. sleep is a utility that enables users to suspend execution of batch- or script files for a specified time. 2000-09-08: sleep 1.0 is released. Features full support for DOS switchar and time-slicing for operating systems that support it. which comes from the UNIX world. which is a utility that enables users to track down executable files residing in the directories listed in the PATH environment variable. 2002-03-20: which 2.1 is released. Fixed a bug where 'which' would display a file twice if the -a or -ad option were used and the current working directory was also listed in the PATH. Fixed a bug that caused which to fail to search the last directory listed in PATH. Added support for the DOS switchar. BOINCprog is a small graphical utility to help Linux users monitor progress of BOINC projects. The app reads BOINC's client_state.xml file once every 5 seconds to get a progress update for the work unit currently being crunched. Please note that BOINCprog only works on systems for which a single CPU is crunching WUs. Systems utilizing multiple CPUs will only see the first active slot reported. BOINCprog can run as a KDE Panel/Gnome Tray application. To facilitate running multiple instances of the program for monitoring multiple BOINC installations on NFS mounts, BOINCprog writes its BOINC installation directory as the window title. 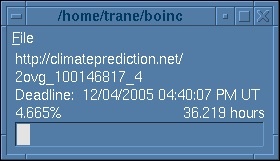 2006-08-15: BOINCprog 1.1.6 is released. This is a minor maintenance release. This version fixes a bug that left the deadline in place from the previous workunit when BOINC was currently out of work. Added the ability to disable the GPL splash screen (at last!). See the ChangeLog and startboincprog script for details.